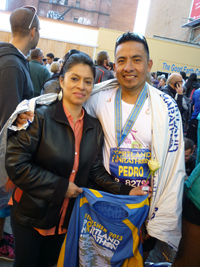 Wood River Valley recreational runner Pedro Gonzalez, 38, completed the 43rd annual Portland (Ore.) Marathon on Sunday, Oct. 6. His final time was three hours, 35 minutes and one second. Gonzalez was 752nd overall of 6,813 finishers with a pace of 8:13 per mile. He placed 111th of 520 runners in the Men’s 35-39 age class. The men’s winner was Jameson Mora, 29, of Arroyo Grande, Ca. in 2.20:54. Gonzalez, whose personal goal for the 26.2-mile race was to finish under four hours, was sponsored by Solemates and the local Girls on the Run group. Mary Fauth, executive director of Girls on the Run of the Wood River Valley, said, “Solemates is the charity racing part of Girls on the Run. It adds an additional meaning to a personal race effort when runners choose to dedicate the effort to GOTR and ask their friends and family to support by making a donation to GOTR. “Knowing that taking on a big race effort can be not only a time-consuming effort, but one that comes with significant cost, we look for ways to help an individual meet a major race goal they might not have been able to do on their own.